West Kennett Longbarrow (2), Nr Avebury, Wiltshire. Reported 28th July. The construction of the West Kennett Long Barrow started some 5600 years ago and it predates Stonehenge. 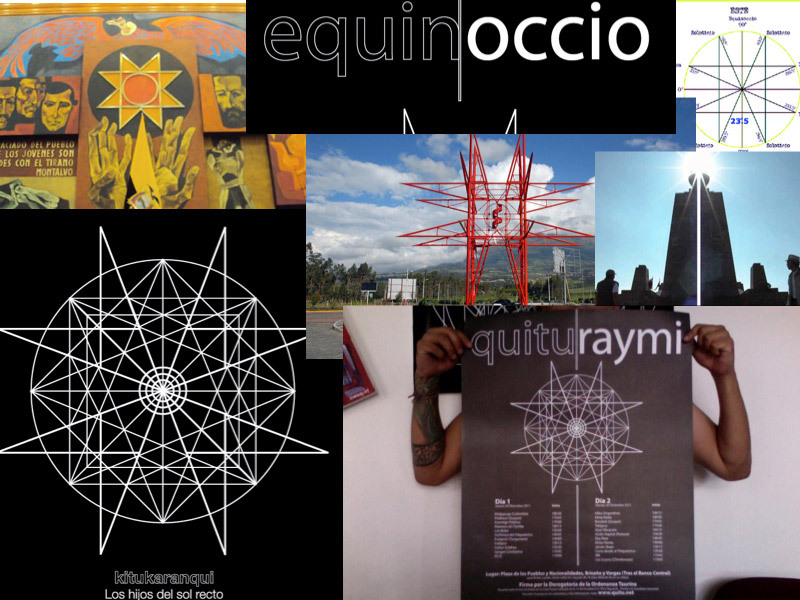 Therefore, like the other formation at this location it refers to the very beginning of modern history. The Hebrew calendar started September 7, -3760 (proleptic Gregorian calendar; note that -3760 = 3761 BC). The 8-pointed stars of 16 segments refer to that. This means that the number 16 pops up several times in relation to this fact in connection with the near future. On the date of the formation it was exactly 293 Katuns (a Katun = 20 × 360 days) ago that the Hebrew calendar started. Note that a Katun is 16 × 15 × 30 days (30 days approximates the lunar month). On September 7, 2016, the Hebrew calendar and the creation that is going hand in hand with that, will not only exist exactly 16 × 19 × 19 tropical years, but this is also the same date referring the classical tzolkin-calendar in comparison with September 7, -3760 (7 Men). On October 2, the end of the Hebrew year 5776, the Hebrew calendar will not only exist 16 × 19 × 19 calendar-years, but also exactly 16 × 19 × 235 lunar months (19 calendar-years = 235 lunar months). The formation also refers to the near future, namely 16 weeks ahead in future: 17 or 18 November. 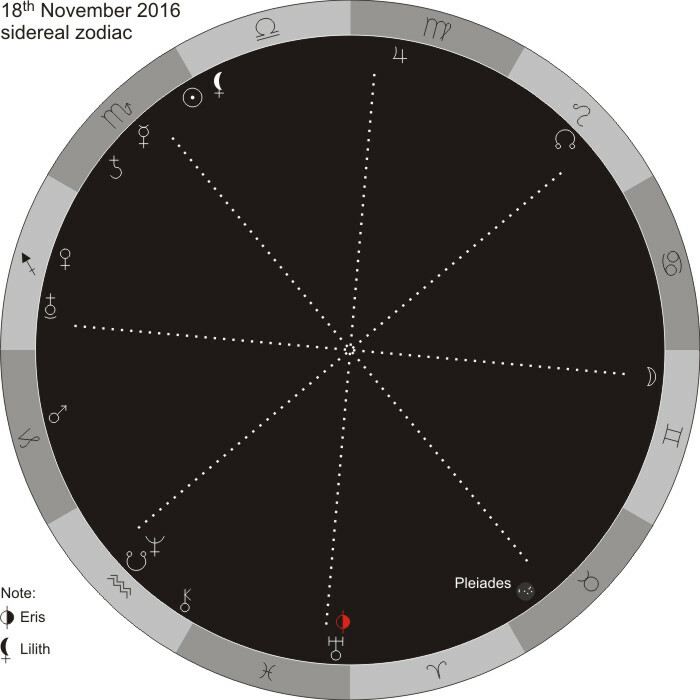 The horoscope below (sidereal zodiac) clarifies that cosmology on November 17 and 18 corresponds with the 8-pointed star!! One of the 8 points is orientated towards sunset on September 7, when the Hebrew calendar will exist exactly 5776 tropical years = 8114 Tzolkin-cycles. Two other points are orientated towards the opposition of the sun and the Pleiades on November 22: while the sun will set in the direction of one point, the Pleiades will rise in the opposite direction of the opposite point. The formation connects an important starting point with an end. The year-counting of the Hebrew calendar relates to the Tanakh/the Bible. According to orthodox religious believe, the world was created in the year AM 1, 5775 years ago. Although this is a flaw, the fall of man that Genesis describes is correctly dated some 5775 years ago. This deals with the story of Adam and Eve and the tree of knowledge of good and evil and of the tree of life in the Garden of Eden: the story of the fall of man. However, this and other formations show that the process of resurrection of humanity will start in November 2016. The octagon is a symbol for Islam. Eight is the number of completion of all concerns and a new beginning. The two rings are standard circles of damage/destruction for the comet or fragment impacting at the center. They may also indicate two separate impacts in Muslim lands. The tiny center circle and eight tiny circles would suggest smaller fragment impacts compared to the center impact. Surrounding the impact site are shocked quartz and/or nano-diamonds which have appeared in various prior crop circles and imply a violent, massive strike. See T1117, pg. 173, and GBR (03/07/20), and GBR (04/07/25), both on pg. 175. The background indicates the strike will be at night. 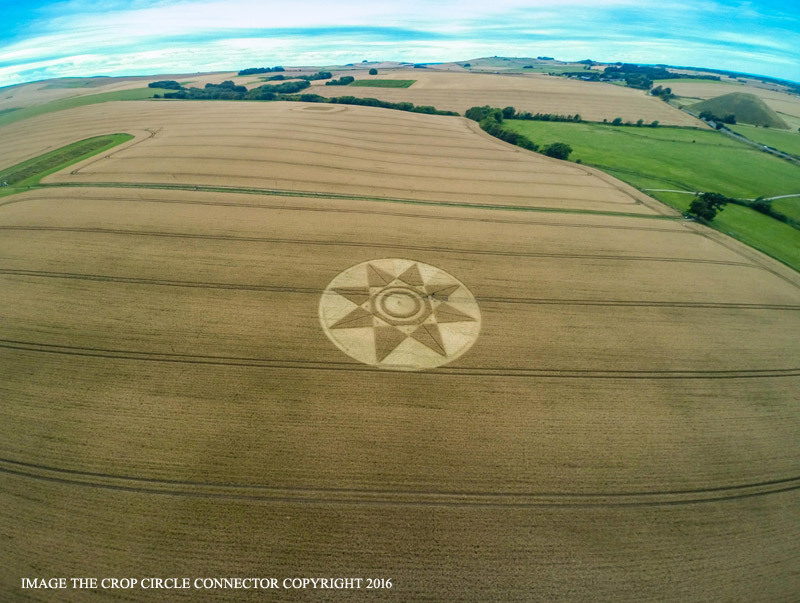 The aliens seem to be making a comment about the current wave of Islamic terrorism, in that the most crop circles appear in nominally Christian countries, and Comet B will strike in Northern Europe at night. Download the free ebook at http://theheckhypothesis.com/aboutthebook.html to reference the pages mentioned. Los conocimientos astronómicos de los kitus “los hijos del sol recto”, en los alrededores del año 1200 y mucho antes de la expansión de los inkas, fueron tan altos como aquellos de los egipcios, babilonios, mayas o aztecas, pues estuvieron familiarizados con la observación de las constelaciones como la de Escorpión (la del puma o Coquechinchay), Osa Mayor (la del mono o Chinchay), y la misma Cruz del Sur (o Chakana); fundamentalmente, con el conocimiento del movimiento de presesión de los equinoccios, debido a la inclinación del eje de la tierra (23º 27`) y por lo tanto, con el ángulo de la eclíptica que influye en la orientación de las salidas y puestas del TAITA INTY, durante las cuatro grandes partes astronómicas y rituales del año: dos solsticios y dos equinoccios; conocimientos todos, que fueron magistralmente diseñados en la estrella solar KITU-KARANKI.